SmartList is a productivity app. by Left Coast Logic that helps you to manage your busy day. Complete with a main to-do list section, history section, and shopping list section. On the main to-do list screen, there is a duration bar across the top of the screen so you can adjust from the current time to when you anticipate the “end” of your day to be. Once you set the end of your day, the app. will automatically draw a line between the items that you have time to finish today and those that will be done tomorrow. The top section (to-do today) is in color with a black background and the bottom section (to-do tomorrow) appears in muted color with a grey background. This makes it easy to distinguish how many more items you should have time to take care of today. You add a new to do item by tapping the “+” button in the upper right hand corner of the main screen. You can enter the name of the task, location, duration, start/end time, whether or not it is “home time” or “work time,” and give the task a category: Urgent, Family, Recreation, Errands, etc. There are also 7 additional colors besides the ones that belong to those main categories, so you can create your own color-coordinated categories that work for you. You can also add notes when you are editing a task. You can delete tasks, mark them as done (or undo marking them as done), duplicate them, edit them, or sort them by created date or due date. You access all these options by tapping on the bar of the individual task. 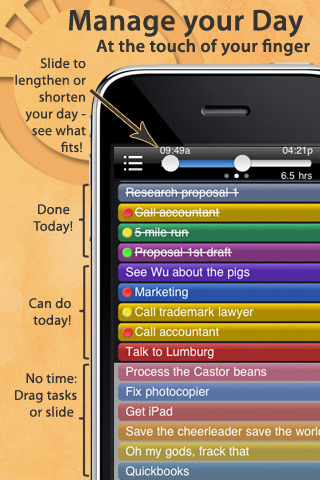 You can also drag the tasks into whatever order you’d like them to appear in. If you page left by sliding the main screen to the right, you can access your history section. This is pretty straightforward- the best thing about the feature being that you can email an excel data export of the info in your history to someone by tapping the picture in the upper right hand corner (it looks like a page with an arrow pointing to the right). If you page right, you will access the shopping list section. You can create as many separate lists as you’d like, and within each list you can add, delete, mark as done, reset, and mark as needed. I love the way this feature functions, because you never have to re-write your main grocery list. Just add any unusual items, and then mark as done or needed as things get purchased or run out. I wish there was an export option in this section, but there is not. For $0.99, I think SmartList is totally worth it if you are looking for an easy way to keep yourself organized. You won’t have to spend hardly any time figuring out how to use it, giving you more time to tackle your actual to-do list. AppSafari review of SmartList was written by Tyne Kennedy on May 26th, 2010 and categorized under App Store, Notes, Productivity. Page viewed 3863 times, 2 so far today. Need help on using these apps? Please read the Help Page.